Realty firms have returned to initial public offerings (IPOs), signalling a recovery in the sector, but the market’s guarded. The draft red herring prospectuses filed by four realty firms last week list instances of litigations, criminal cases, unclear titles, debt overhangs and unproven delivery records. Emaar MGF Land Ltd, Ambience Ltd, Sahara Prime City Ltd and Lodha Developers Pvt. Ltd are raising a combined Rs11,215 crore through the proposed IPOs. Together, they have a land bank of about 24,790 acres. But investors would look at the organizational bandwidth of a firm and its corporate governance abilities rather than just land banks, said Anuj Puri, country head of Jones Lang LaSalle Meghraj, an international property consultant. “Investors are cautious now and would gauge what the developer is finally leaving on the table and look at the price of the issue," he said. The market is also guarded as these firms are relatively new with a short and yet unproven track record, said Nitin Adnani, an analyst with Enam Securities Pvt. Ltd, banker to both Sahara Prime and Lodha Developers. Sahara Prime, for example, was set up in December 2007 and has its first set of 11 projects under way. The firm also plans to build 77 townships in small markets where consumer demand has not been tested. Several of Lodha’s and Emaar MGF’s land parcels don’t have guaranteed titles of ownership. And Sahara group companies and promoters face some 130 court cases. Analysts are wary if this rush of realty listings will garner enough interest. “There is only so much investor appetite and there are too many IPOs being planned at the same time in the same sector," said a Mumbai-based analyst, who didn’t want to be named. In addition to these four firms, several other realty companies such as Shriram Properties Ltd, Oberoi Constructions Ltd and Godrej Properties Pvt. Ltd and Nitesh Estates are set to file their draft prospectuses in October. Emaar MGF is a joint venture between Dubai’s largest developer Emaar Properties PJSC and New Delhi-based MGF Developments Ltd. Its public listing is the largest in this round of IPO fund raising by realty firms. Emaar MGF, formed in December 2005, had planned an IPO in 2008 but dropped out due to the downturn. Rs3,850 crore. Of this, it will use Rs276.8 crore to pay development charges and licence renewal fees, Rs1,772.6 crore to settle some debt, Rs820 crore for the redemption of preference shares, and Rs199.5 crore for funding its subsidiary Emaar MGF Construction Pvt. Ltd.
About 11,340 acres of land and 29 residential, commercial and retail projects with total saleable area of 26.3 million sq. ft, as on 31 August. Emaar MGF is developing the Commonwealth Games Village project in east Delhi over 118 acres. Several of its land reserves are facing litigation and the firm faces uncertainty of title to its land. Emaar MGF’s offices across the country and the homes of some its promoters were subject to an income-tax raid in 2007. Some 60% of Emaar MGF’s land reserves is registered in the names of its subsidiaries, and about 75% of it is agricultural land, for which the firm has not yet obtained a certificate allowing the change of land use. 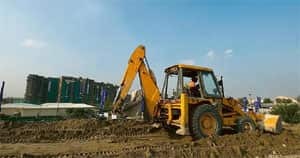 The firm will have to pay the Delhi Development Authority a penalty if the Commonwealth Games Village project is delayed—Rs15 lakh a day for the first 15 days of delay and Rs20 lakh a day after that. “The key thing to look out for is the pricing of the IPO and the valuation of the company," said Shailesh Kanani, an analyst with Angel Broking Ltd. “The company should ideally come out with a price which is at a discount to the share price of its peers DLF Ltd and Unitech Ltd."
Promoted by Bharatiya Janata Party politician Mangal Prabhat Lodha and his sons Abhisheck and Abhinandan. Deutsche Bank AG invested Rs1,640 crore in Lodha’s subsidiary Cowtown Land Development Pvt. Ltd in 2007 by subscribing to debentures that are convertible into shares if there is a default in payment. Rs2,790 crore with a 10% greenshoe option. It will use some of the money to retire part of its debt and Rs1,833 crore for projects. It has 4,170 acres of land and 38 ongoing and 11 planned projects primarily in Mumbai. The firm develops high-end projects but entered the mid-segment, Rs20-30 lakh category this year to boost demand. It has also technically qualified for one sector of the Rs15,000 crore Dharavi slum redevelopment project in Mumbai, but the project is facing hurdles. Uncertainty in the title to some of its assets, primarily land, which could hurt its revenue. It has a number of projects under construction but delivery remains undecided. “The primary concern about Lodha is delivery though there is no questioning their construction standards. They have a lot on their plate and need to prove themselves by delivering on time," said an analyst, requesting anonymity as his firm’s policy bars him from commenting on IPOs. A Gurgaon-based real estate developer promoted by Raj Singh Gehlot. It was launched in 1986. Rs1,125 crore, with a greenshoe option of equity shares for cash up to Rs168.75 crore. It plans to use the proceeds to fund the development and construction of some of its projects, pay development charges for its Ambience City township at Panipat, and prepay certain loans. Ambience has land reserves of 816.56 acres, 95% of which is in the National Capital Region that includes Delhi’s suburbs. It has developed various projects such as the Lagoon apartment complex and the Ambience Malls in Gurgaon and Vasant Kunj, New Delhi. It is now developing the Catriona residential project at Ambience Island, Gurgaon, with 240 condominiums. Some of its directors, including Gehlot, are facing criminal proceedings. The company also faced an income-tax raid in 2007, when documents, cash and jewellery were seized. About 75% of its land reserves is agricultural land. Ambience owns less than 1% of its land reserves directly. “Smaller players such as Lodha, Ambience do not have a track record similar to a DLF or a Unitech," Manoj Jain, an analyst with India Infoline Ltd, said. “I am not sure the smaller players will be able to time the market correctly." The Lucknow-based firm is the realty arm of Sahara India Pariwar, promoted by Subrata Roy. It was launched in December 2007. Rs3,450 crore, including a 15% greenshoe option. It will use the proceeds to part repay debt and fund its integrated townships. One of the biggest land aggregators in the country, Sahara Prime has spent about Rs1,400 crore to buy 8,464.64 acres of land. It has 10 projects under construction and 16 in the pipeline. Its long-term plans include 77 townships. Various group companies and Sahara India face some 130 criminal cases. Only about 15% of Sahara Prime’s land bank is reserved for commercial development. At least 50% of the agricultural land it holds has not been converted for commercial use. “The two basic concerns about Sahara is that the company is targeting a totally different set of smaller markets which haven’t been tapped before," said an analyst with a Mumbai-based brokerage firm, requesting anonymity. “The good side is that they have already got good response from more known markets such as Nagpur and Lucknow in the last one year."